<posted August 28, 2014> :: I feel my fingernails digging into the last days of Summer, begging for it to stay just a few more weeks. The air is filled with crickets, katydids, croaking and face-melting humidity. Gotta love the Midwest. The swallowtails are everywhere. That is one in the photo above, enjoying some of the 'Milk Shake' echinacea. So many kinds of swallowtail and echinacea! I never get bored. The monarchs are finally here, too, feasting on the bronze fennel and butterfly weed that has taken over a large corner of an island. Today I noticed one skinny caterpillar and one single chrysalis. They flock around this planting in the morning, when the dew is still seen on the ferny black fennel fronds and then return again just before the night falls. I am so glad to see them here as they evoke many memories for me, all of them colorful and happy. Did you hear that Joe Goudeau is back in the game with some great 2014 intros? I finally got my hands on his GREEN EGGS AND HAM! I have this 'thing' for Louisiana daylilies. I am especially looking forward to WHIPPED CREAM AND STRAWBERRIES, which I just got at the R11 Summer Meeting. my Illinois garden last summer. I also forgot that I added PINK FREEZE last year, but the large clump that bloomed this year obviously didn't forget me. Planted as three small fans last fall, its now 5 HUGE ones. Here it is blooming this year. Nicole DeVito, the hybridizer of PINK FREEZE is coming to speak in St Louis on September 19. Everyone is welcome to attend the presentation, followed by a short auction of her introductions and the clubs return plants. I also grow many of Nicole's other introductions. I added GOLDEN TICKET and LIKE A DREAM this year. Maybe I'll grab more when she comes next month. I'm sure you remember how much I like her BULLETPROOF. 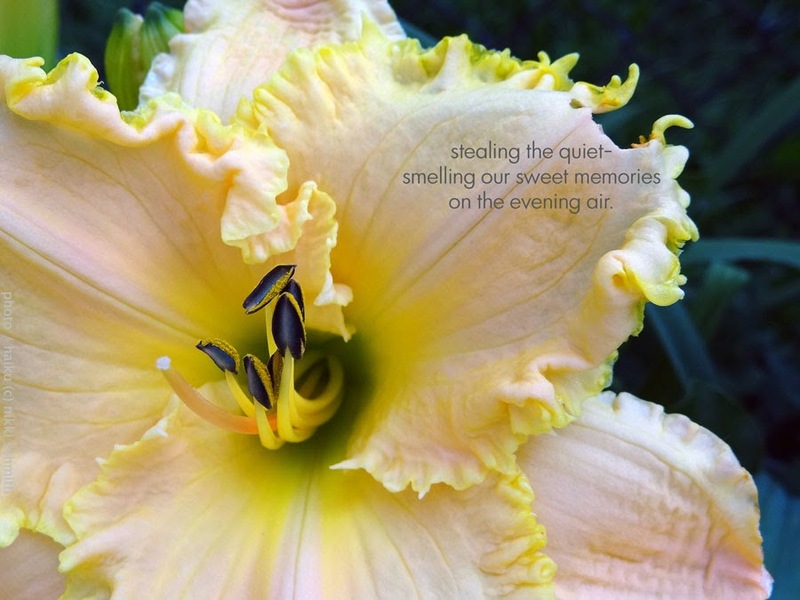 Daylilies are, as many testify, just as much about the people as they are the plant. Seriously. How many of you have ALL the introductions by certain hybridizers because you love the PERSON who introduced them? The work is reflective and inclusive of the effort. Even when I'm alone in my garden, I am surrounded by friends and memories; I want to make sure those memories are the ones worth remembering. Here is an ugly people-story I could not NOT share. Recently, I had a completely unnecessary and unkind exchange with a well-known auction seller. The first of its kind after LOTS of years on this fab site. When my purchase was complete (I held up my commitment to buy from them even after the terrible attitude) and their new introductions arrived, they promptly went in the trash. Yes, I know that doesn't hurt anyone but me and my wallet in the short term, but I made my own silent statement by doing so. I couldn't stand to think of walking past those plants in the garden and remembering the mean-spirited exchange that happened during the transaction. So I threw them out. And then I didn't have a problem digging up and selling off the other plants introduced by said Nasty McNastypants. Not my circus. Not my monkeys. Til next time - be nice y'all. It's suuuure easier. Looking forward to your National tour post, Nikki! Btw...i like how you 'handled' that Mr. McNastypants...lol.